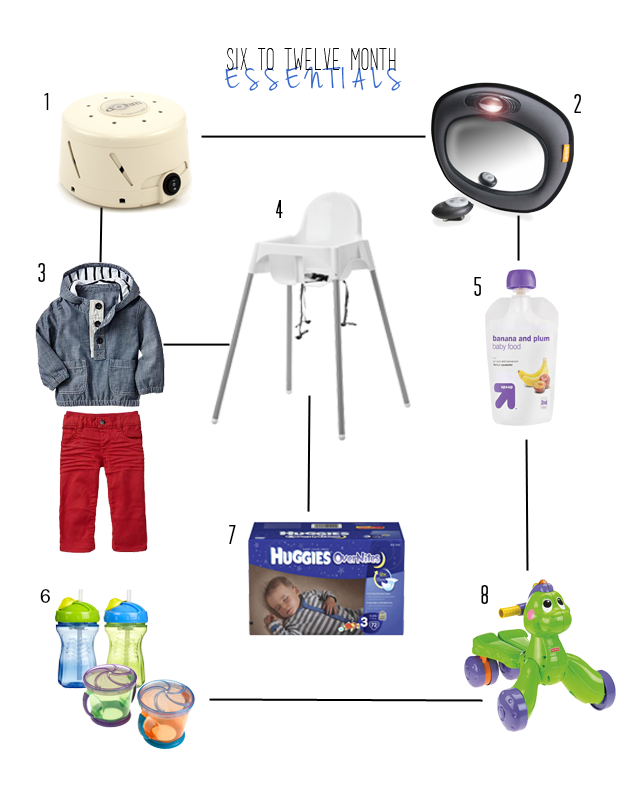 So I know I am still a mom newb, but I did the newborn and colic essentials post so I thought I would add our favorite items for the second half of the first year! 1. This white noise machine is amazing, we bring it in our suitcases on all our trips just because we love it so much. It helps Everett sleep, and blocks out outside noise too, so even in our little apartment, we don't feel like we need to whisper after we put Everett down. It is actually really soothing, we are debating getting one for our room as well. 2. Car mirror. This item changed my life. I would actually recommend this from day one. When Everett was a newborn (before we had this) I would get so scared when he stopped screaming suddenly (he despises the car seat) and was silent, I would have to pull over multiple times to make sure he wasn't blue in the face choking or something (yes-first time mom). So now, I can see exactly what he is doing and it gives me so much peace of mind while driving (well as peaceful as it can be with a screaming child) We don't even use the remote or light, so you could get a simpler, cheaper one that would probably be just fine. 3. I should basically be Gap Baby's spokesperson because I love their clothes so much. They are super trendy, great quality and affordable when you wait until a sale. Just last week, Gap was offering 40% off sale items, and I got Everett 8 items for $30. I usually pay less than 5 dollars for shirts and onsies and 5-14 dollars for pants. I stock up on bigger sizes when they have sales like this too. Another favorite is a Canadian brand called Joe Fresh (sold at the Canadian Superstore) but recently JC Penney started carrying some (not all) of their stuff. Also great quality and very affordable. 4. Everett spends a lot of time eating and therefore a lot of time in this highchair and we LOVE it. It was only 20 bucks from IKEA. It is the perfect size, has a strap and wipes down easily. Such a good bang for your buck. 5. Target Up&UP baby food pouches. I usually tried to make Everett's baby food when we were home and now he mostly eats table food, but these are so great when you are on the go or out to eat. These are by far the cheapest baby food pouches I have found (only 89 cents with extra 10% off with Target Cartwheel app) and they are actually the ones Everett prefers to the more expensive ones. His favorite are banana/plum and pumpkin/banana. 6. Straw sippy cups and snack containers. These are a diaper bag staple. There is some research out there that sippy cups aren't always great for babies (can lead to more ear infections, speech problems and chewing and swallowing wrong) I don't know how true that is, but we decided to do straw sippy cups instead which aren't necessarily associated with those problems and bonus-Everett learns to drink from a straw. The snack containers are great so that Everett can grab the snacks himself without getting to many because of the way the lid is designed. 8. Everett just got this walk-and-ride toy for Christmas from his Grandma and Grandpa Mac after showing an intense desire to push things around the house (ie-laundry baskets) and falling in love with a pink one he tried out in NH. So, after a lot of review reading on every walk and ride toy out there, this was the winner and Everett LOVES it. Here is a link to the other one I liked too. YES. I love all of this! I was also a nervous car puller over-er whenever Ralph stopped crying in the backseat. Man, it's hard to be a mom sometimes. :) And! Ralph always pushed laundry baskets around, too! I always thought it was so funny.